Visual Astronomy: See the LCROSS Lunar Impact! 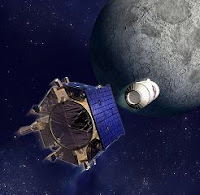 See the LCROSS Lunar Impact! The Impact Has Already Occurred! On Friday, October 9, at 11:30 UTC, our Moon will have a new crater! The source of this new crater will be NASA's LCROSS (Lunar Crater Observation and Sensing Satellite) spacecraft. The LCROSS system is composed of two spacecraft: an impactor, and the "shepherding" craft. The impactor will slam into the Moon's surface at a very high speed, creating a new crater. Four minutes later, the shepherd craft will fly through the plume of Moon dust created by the impactor, sampling the freshly excavated Lunar soil. In light of the recent finding of faint traces of water on the Moon, this is a very significant mission! The coolest part, however, is that you should be able to see the impact from home in telescopes 10" or larger! How Can I See the Impact? The impact will occur on Oct 9, 2009 at 11:30 a.m. UTC. For US readers, this is 4:30 Pacific, and 7:30 Eastern. The dust plume will be in the Moon's South Polar Region, so point your telescope there. Viewers that will have a night-time view of the impact will have the best chance of actually seeing the impact. Viewers in the Eastern time zone in the US may not be able to see it, as the sun will be rising at just about the same time. NASA also recommends a telescope of at least 10". While under good conditions, an 8" telescope might work, a 10" very well may be the practical limit. Binoculars and the naked eye also will not be sufficient to see the dust plume. What If I Don't Have a 10" Telescope?! If you don't have access to a telescope that large, however, you can still attend one of NASA's public viewing parties, or find a local amateur viewing party! Some viewers will even be able to watch the event on NASA TV. In all, it should be a great event! For more details on the actual impact, check this page on the impact plans. Appreciate it just for an alternative imperative document. I had a fabulous speech inward workweek, and additionally Now I’m hunting for these sort of knowledge. At this time follow check cashing Regards just for stating.